JavaFX is a library for building rich client applications with Java. It provides an API for designing GUI applications that run on almost every device with Java support. In this tutorial, we’re going to focus on and cover some its key capabilities and functionality. In Java 8, 9, and 10 no additional setup is necessary to start working with the JavaFX library. The project will be removed from the JDK starting with JDK 11. JavaFX uses hardware accelerated graphics pipeline for the rendering, known as Prism. What’s more, to fully accelerate the graphics usage, it leverages either software or hardware rendering mechanism, by internally using DirectX and OpenGL. JavaFX has a platform dependent Glass windowing toolkit layer to connect to the native operating system. It uses the operating system’s event queue to schedule thread usage. Also, it asynchronously handles windows, events, timers. The Media and Web engines enable media playback and HTML/CSS support. Stage is the main container and the entry point of the application. It represents the main window and passed as an argument of the start() method. Scene is a container for holding the UI elements, such as Image Views, Buttons, Grids, TextBoxes. The Scene can be replaced or switched to another Scene. This represents a graph of hierarchical objects, which is known as a Scene Graph. Each element in that hierarchy is called a node. A single node has its ID, style, effects, event handlers, state. Additionally, the Scene also contains the layout containers, images, media. Prism rendering thread – responsible for rendering the Scene Graph separately. Application thread – is the main thread of any JavaFX application. All the live nodes and components are attached to this thread. init() – is called after the application instance is created. At this point, the JavaFX API isn’t ready yet, so we can’t create graphical components here. start(Stage stage) – all the graphical components are created here. Also, the main thread for the graphical activities starts here. stop() – is called before the application shutdown; for example, when a user closes the main window. It’s useful to override this method for some cleanup before the application termination. The static launch() method starts the JavaFX application. JavaFX uses a special FXML markup language to create the view interfaces. This provides an XML based structure for separating the view from the business logic. XML is more suitable here, as it’s able to quite naturally represent a Scene Graph hierarchy. Finally, to load up the .fxml file, we use the FXMLLoader class, which results in the object graph of the scene hierarchy. To get practical, and let’s build a small application that allows searching through a list of people. Notice how, to wrap up the int, String and boolean values, we’re using the SimpleIntegerProperty, SimpleStringProperty, SimpleBooleanProperty classes in the javafx.beans.property package. Our main class overrides the start() method, which is the entry point for the program. Then, the FXMLLoader loads up the object graph hierarchy from SearchController.fxml into the AnchorPane. After starting a new Scene, we set it to the primary Stage. We also set the title for our window and show() it. Note that it’s useful to include the main() method to be able to run the JAR file without the JavaFX Launcher. Let’s now dive deeper into the SearchController XML file. AnchorPane is the root container here, and the first node of the graph hierarchy. While resizing the window, it will reposition the child to its anchor point. The fx: controller attribute wires the Java class with the markup. In our example, inside of the horizontal HBox panel, we used a Label to place text, TextField for the input, and a Button. With fx: id we mark the elements so that we can use them later in the Java code. After populating the @FXML annotated fields, initialize() will be called automatically. Here, we’re able to perform further actions over the UI components – like registering event listeners, adding style or changing the text property. Now that the visual aspects are handled, let’s start looking at binding data. The binding API provides some interfaces that notify objects when a value change of another object occurs. We can bind a value using the bind() method or by adding listeners. 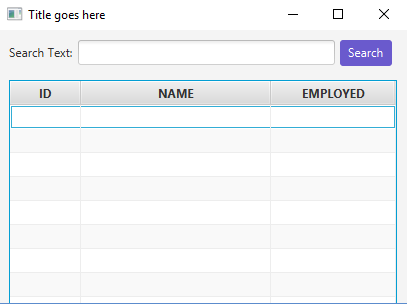 Here, any change in the search field will update the text value of the label. By comparison, bidirectional binding synchronizes the values of two properties in both directions. The Observable interface allows observing the value of the object for changes. Here, any model change like insertion, update or removal of the elements, will notify the UI controls immediately. Working with the UI components in a scene graph isn’t thread-safe, as it’s accessed only from the Application thread. The javafx.concurrent package is here to help with multithreading. Here, we create a one-time task javafx.concurrent.Task object and override the call() method. The call() method runs entirely on the background thread and returns the result to the Application thread. This means any manipulation of the UI components within this method, will throw a runtime exception. The setDaemon(true) flag indicates that the thread will terminate after finishing the work. We can describe an event as an action that might be interesting to the application. For example, user actions like mouse clicks, key presses, window resize are handled or notified by javafx.event.Event class or any of its subclasses. We can change the UI of the JavaFX application by applying a custom design to it. By default, JavaFX uses modena.css as a CSS resource for the whole application. This is a part of the jfxrt.jar. 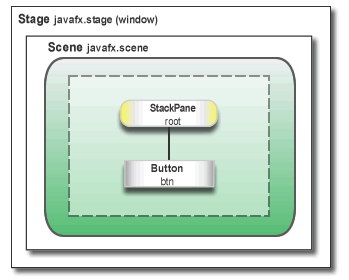 This brief write-up covers the basics of JavaFX API. We went through the internal structure and introduced key capabilities of its architecture, lifecycle, and components. As a result, we learned and are now able to create a simple GUI application. And, as always, the full source code of the tutorial is available over on GitHub. Java 10 will remove Java FX by default making the process cumbersome again. Java FX has been a lame duck for years. Actually, Java FX will be removed from JDK 11. So, it should be “In Java 8, 9 & 10, no additional….”. Yep, looks like it. Thanks, updated.